Steeped in history, The White Bear theatre pub has been in the heart of south London since 1780. Being a proud south Londoner I found this fact harrowing as I’d never heard of it or seen any of their productions before. As I ordered my pale ale I was also informed that The White Bear has just completed an impressive refurbishment which was clear to see as this glorious old boozer is now a mix of eclectic styles for those gastronomy hunters. The staff were so friendly and the pale ale went down a treat in their huge beer garden, pre-curtain. 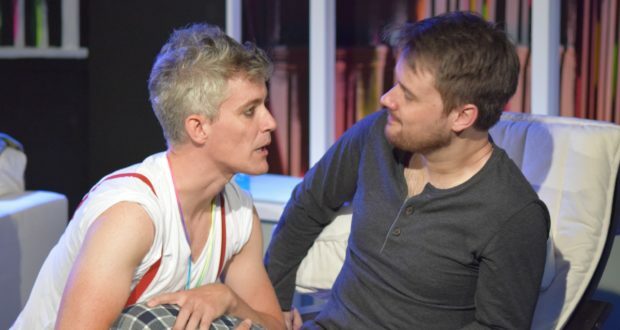 The pub’s theatre tries to champion and support new work as much as possible and this time around it’s an original play called Sheep, from playwright David Cantor. Now you’d be forgiven if you thought this was about livestock or the plight of British farmers post-Brexit. It is, in fact, all about that very important bodily function – sleep. Or lack thereof in this case. Sheep, billed as a modern day insom-com, focuses on sleep deprivation, existential angst and all the alternative realities that kick in if you don’t get any shut-eye. The plot, after only one pale ale, took me a while to get my head around. It’s apparently been twenty-one nights since Dexy last slept. 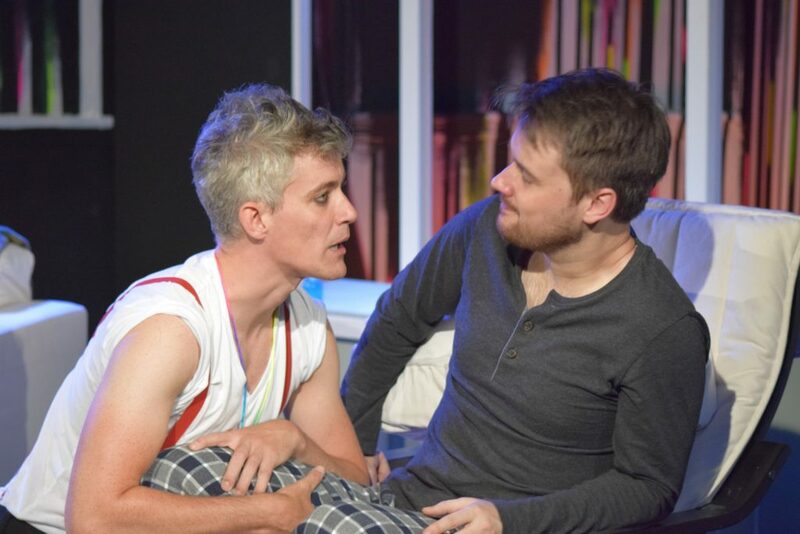 This was my first disconnect with the plot as I expected Dexy, played by the rather handsome Ciaran Lonsdale, to look like a zombie from 28 Days. Instead he was looking somewhat fresh and perky. I don’t know about you but if I haven’t had enough sleep I’m the devil incarnate, so Lonsdale’s chatty and totally lucid Dexy just didn’t resonate with me at all. But why has been up so long? Could it be his choice of pillow? Could it be the heating in his flat? Or it could be the fact that his girlfriend’s missing, the police are scouring the streets and Dexy’s past is catching up with him. The plot just gets more and more unlikely. Ensconced in his third floor flat, over the course of an evening, Dexy attempts to cast his mind back and fit the relevant pieces together. But as the blare of the sirens gets louder and night turns to morning, the lines between dreams and reality, rational thinking and insanity become ever more blurred. Yes, it’s been done before. Cantor’s script is good and there are some great passages of dialogue across the 70 minutes, but they’re few and far between and I only laughed once. The humour, the pace and the point just aren’t there. As if this weren’t enough, Dexy is visited by three very different people during the night and I suddenly imagined what Scrooge might be like if he’d taken too much Night Nurse. The first visitor is Leo, played to perfection by the dashing and very pretty James Groom. Groom’s Leo is fun and camp, with all the best one liners, though I did find the stereotypes of the rainbow whistle, brink pink cowboy hat, bubbles and banana in his pants a bit try-hard and unnecessary when Groom was so strong. The second visitor is Vic, ‘the dullest man alive’, played by Bruce Kitchener, while the third is Niamh Watson’s Margot. Both actors stand their ground well as they weave through the ins and outs of their individual storylines and Dexy’s subconscious. As an ensemble they all work really well together, but I still found the piece flawed and too slow. As the paranoia escalates with Nigerian traffic wardens and Italian mobsters smashing down doors, Georgia Leanne Harri’s direction really came into its own and was great. There are a few funny moments in this show, but to stop me counting sheep next time it just needs to be a bit tighter and, like a warm cup of Horlicks, have a purpose.